In 2017 we saw increased focus on social responsibility, accountability and transparency. This is not only true for the role that social media platforms play in delivering content, but it is also a concern for brands and marketers in creating meaningful experiences for their audiences. 2018 is seeing the impact of technological advances, such as new developments on mobile, AI and VR, but the real shift seems to be the focus on social values. For instance, the We Are Social Think Forward 2018 Report has developed six key social drivers based on our human needs and motivations to analyse new trends. At the end of the day, we are social animals and that’s at the heart of the growth of social media – by tapping on our need to belong and share, to witness and be witnessed. Hyper Transparency is hype. Don’t say it – prove it. Or rather, show it. Don’t hide the not-so-good bits. Be genuine. If there’s an element of your business that needs improvement, acknowledge it and make sure to broadcast the steps you’re taking to redress any issues. This goes hand in hand with accountability. Build trust and in turn you’ll get customer loyalty and advocacy. Inclusivity: embrace difference and diversity, reflecting the society we live in. Lloyds Banking Group research shows that in the UK only 19% of ads feature minority groups: family make-up, gender, age, ethnicity, disability and sexual orientation. In turn, the same report found that 65% would feel more favourable about brands that reflect diversity. Furthermore, only 47% of people feel accurately represented in ads. Aspirational advertising only goes so far. Fashion brands are starting to feature ordinary people because they are more relatable. But inclusivity doesn’t only apply to values. Universal design principles are also hype, meaning that technologies are more inclusive and accessible, devised for all types of abilities. From consumers to participant advocates: user-generated content will become vital in helping shape a brand’s future. Open the process, make it participative and co-operative. Involve your customers in product development and make them co-creators of your strategy. Make them feel they belong to a community. Micro-influencers: trust is shifting and people rely more on peer recommendations than on paid-for-endorsements. Engage local communities and organisations as well as local bloggers and newspapers; involve them in your campaign and let them become your influencers at a grass-roots level. In fact, studies show that local campaigns drive more ROI than global campaigns. Become a facilitator: it’s become obvious that we all live in our own little bubble. We tend to engage with what reinforces our views and values. And our news feeds reflect that. Platforms and brands can take action by including and encouraging diverse viewpoints, while always promoting tolerance and dialogue. A great example is Heineken’s campaign Worlds Apart #OpenYourWorld. Hyper-Personalisation: this is not just about contextual marketing. With new developments in emotional AI, brands have the opportunity to better understand their customers' needs. Although still at its infancy, many companies are already implementing real-time micro-expression analysis that determines a customer’s mood or emotional analytics to implement better, more intimate strategies. Hyper-Segmentation: Demographics are no longer as relevant as contextualisation. This means establishing an emotional bond with your customers based on their needs and context at the right time. With the high-level of social data available to marketers these days, it's a matter of identifying and leveraging the right KPIs. Facebook Ads are ahead of even Google when it comes to targeting. This will allow you to create more personalised and meaningful content for your social audiences. One-to-One Conversations: with the advent of dark social (outbound sharing via private messaging that accounts for an 84%), many brands have turned to the likes of Facebook Messenger or Whatsapp to engage their customers in a more personal way. This is especially true when it comes to social customer care. Moreover, Chatbots have become incredibly sophisticated and easier to develop. We are going to see a big leap in automated care in the near future. Multi-channelling: optimising your social media content is a must but also a challenge. A concentration on demographics is no longer the key to choosing your channels, even if apps like Snapchat are still the most popular among the younger segments. This year Hootsuite categorised 10 different types of social media depending on user-purpose, which in turn determines the type of content. Not only do you have to provide value to your audience and adapt your content to each channel, but you also must create a coherent experience. Integrating and monitoring your media analytics is going to require a new level of CRM. Mobile keeps moving ahead and has been leading strategy since 2016. In 2017 it accounted for almost 60% of all Internet traffic. Social media platforms are focusing their efforts on the mobile experience (88% of Facebook advertising revenue comes from mobile), adapting ad formats to better suit it. Furthermore, native advertising has radically shifted from publishers to social media, in which Facebook keeps the lead. Finally, video is still king, and live-streaming queen. Although VR video still has a few challenges to overcome, it will soon become the hype. 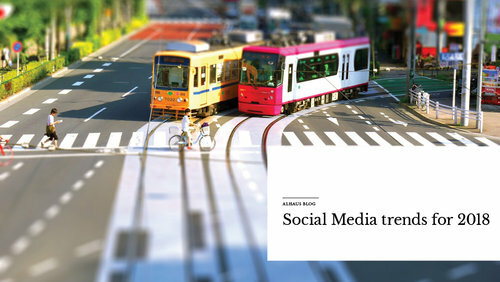 The experts at Alhaus can assist you in embracing the future of social. Contact us today to find out how your content can propel your business forward and engage with your customers on a meaningful level.